Although Maggie and I cannot take holidays abroad anymore – unless we are fortunate enough to be able to go on another cruise – we do consider ourselves very fortunate to have been able to take seven holidays together in Italy. I must admit to very quickly becoming a committed Italophile. 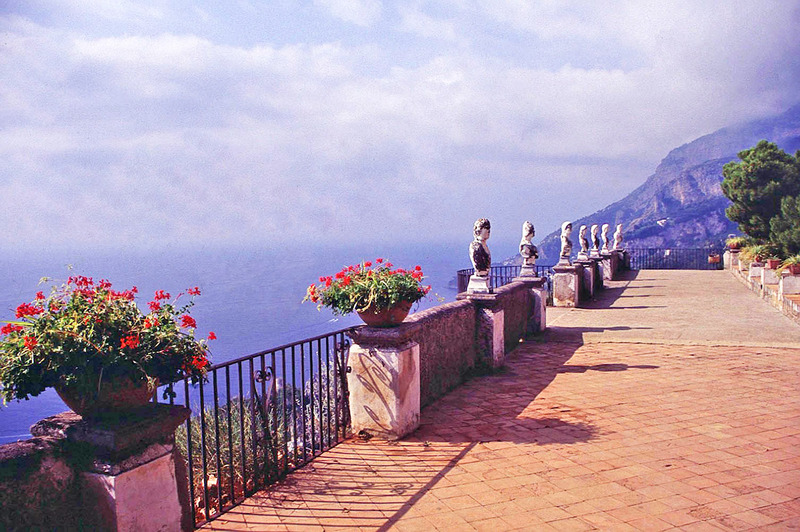 Of the seven, the one that we spent at Ravello remains our favourite. 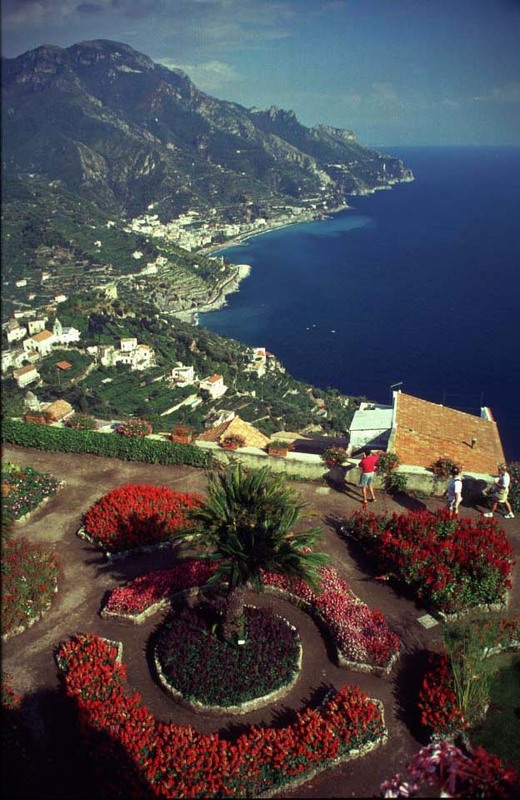 The town sits atop the cliffs that cling to the Amalfi coast, probably one of the most beautiful areas in the world. 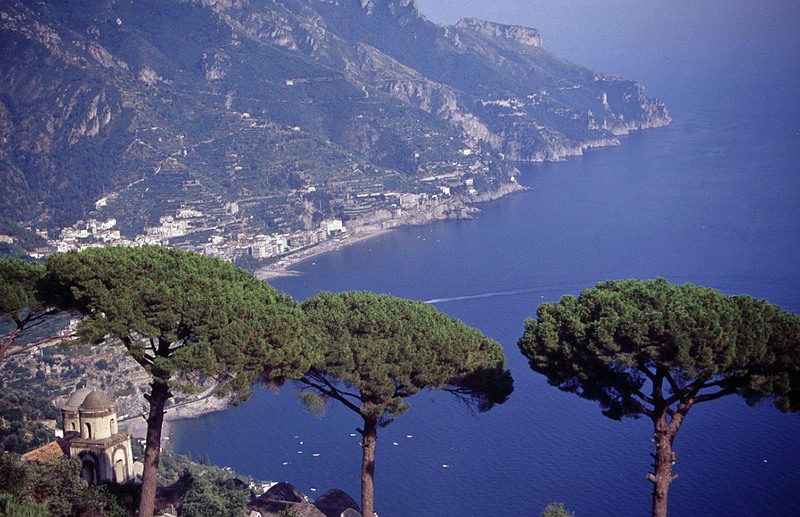 Doubtless many people will have seen the classic Amalfi scene, that of coastline stretching away to Capo d’Orso with, in the foreground, the row of umbrella pines and the small domes of the church that lies below the Gardens of the Villa Rufolo. We stayed at the Hotel Rufolo and awoke every morning to that view; it was like we had died and gone to Heaven! In addition to the Villa Rufolo and its gardens there was also the Villa Cimbrone, a walk of some ten to fifteen minutes from the town centre, together with its gardens. The gardens are so different in character. Those of the Rufolo are open to the elements, full of blazing colour, predominantly red. From the gardens you have an uninterrupted view of Capo d’Orso, which translates as Bear Head, so called because the shape of the land resembles a sleeping bear. 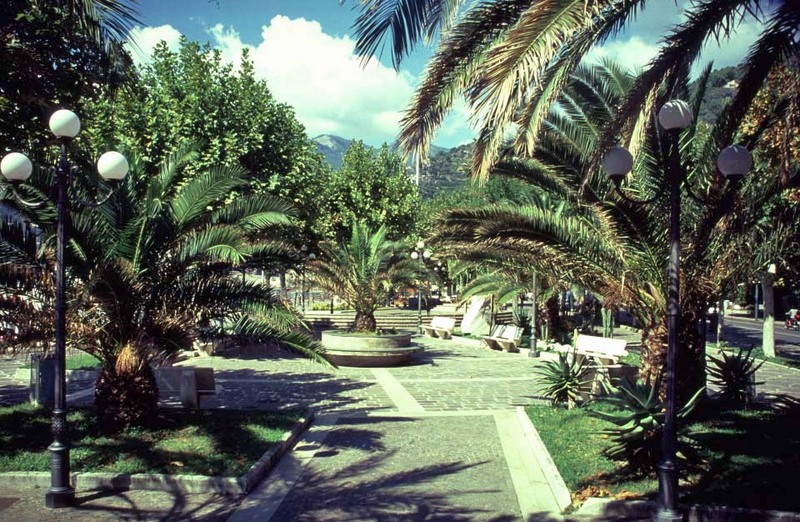 On the other hand, the gardens of the Cimbrone are more enclosed, with a fairly large wooded area. However if you walk along the Avenue of Immensity, past the statue of Ceres, you arrive at the Belvedere of Infinity, such an apt name because you can see for miles in almost any direction. We visited the gardens five times in all, the Rufolo three times and the Cimbrone twice. It was really rather magical. The main town along the Amalfi Coast is of course Amalfi, from where you can take a boat, hydrofoil or bus to Sorrento and the villages along the coast – the incredible Positano and little Praino to the west of Amalfi, and Minori (where we had ice-cream to die for!) and Maiori to the east. 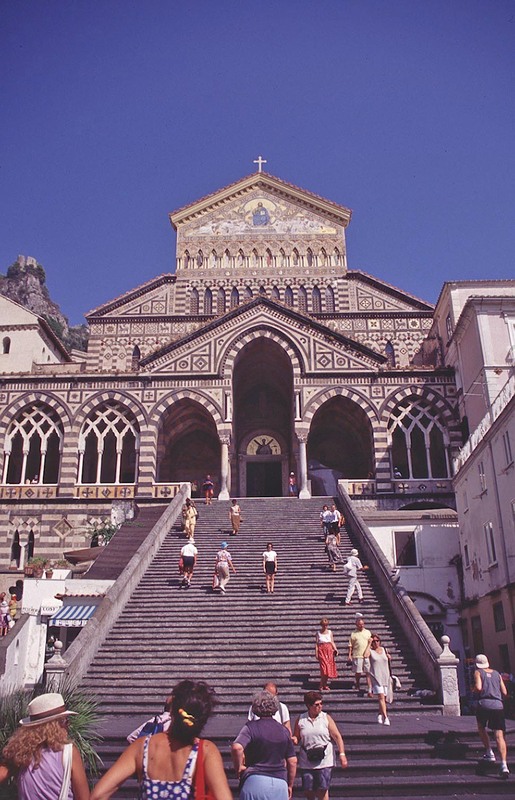 Amalfi has one of the most beautiful cathedrals I have seen, named for St Andrew (Sant’Andrea), raised above the level of the Piazza del Duomo by 62 very wide steps. 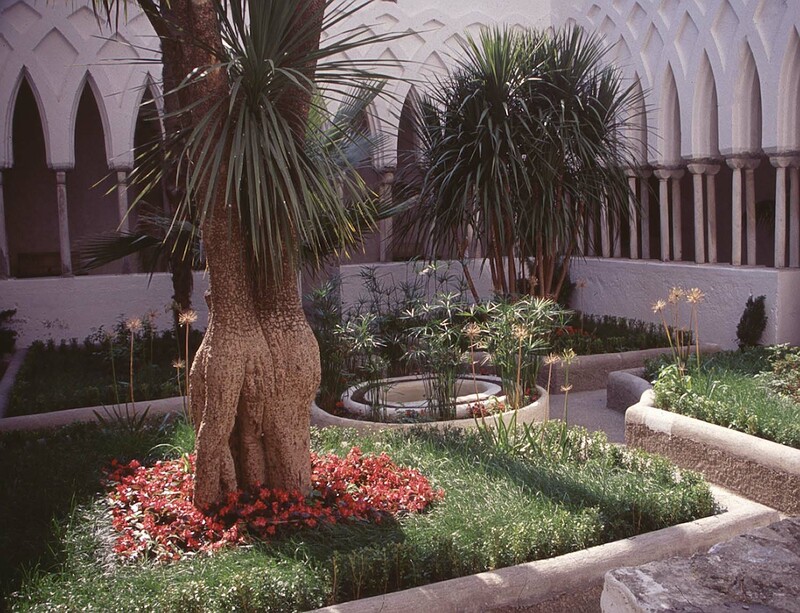 Attached to the cathedral is a cloister that contains a small, immaculately-kept garden. 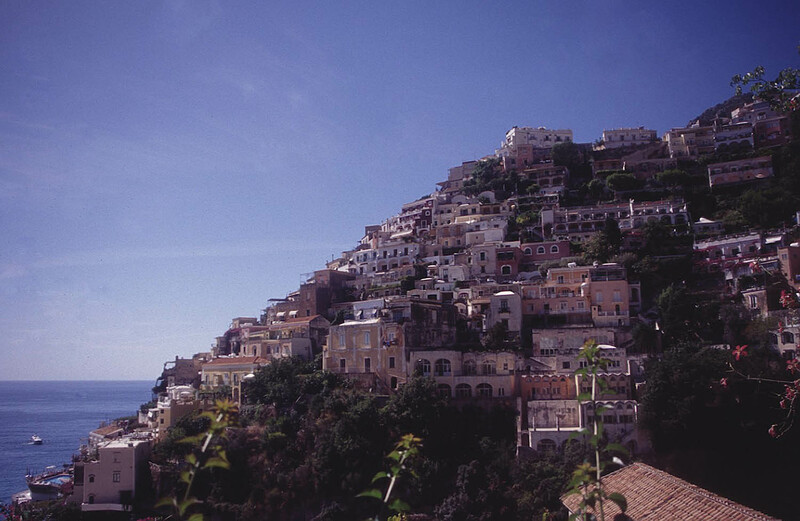 What can one say about Positano? How was it ever built? For the buildings seem to be falling down on each other – not literally, of course, but because they are so close together as they gradually make their way up what is a steep slope. It is an amazing place, where the only form of transport that is possible is by bicycle, not that I would want to try it! It is so colourful, like many Italian seaside or lakeside towns and villages. 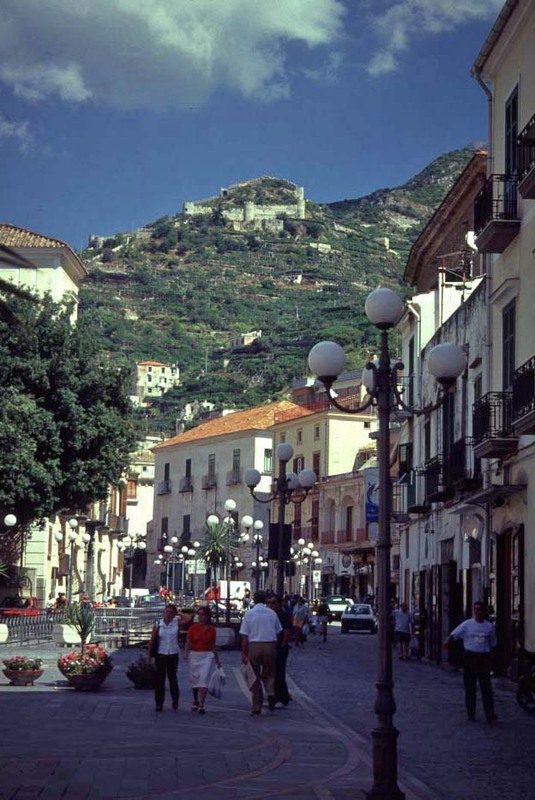 Minori is a very attractive seaside village that we will always remember for de Riso, an ice cream parlour where we had what still remains the most fantastic ice cream. I cannot remember what Maggie had, but I had chocolate and vanilla, with real chocolate and real vanilla. I’ve had some good ice cream since but nothing that compared to what I tasted that sunny day in Minori. 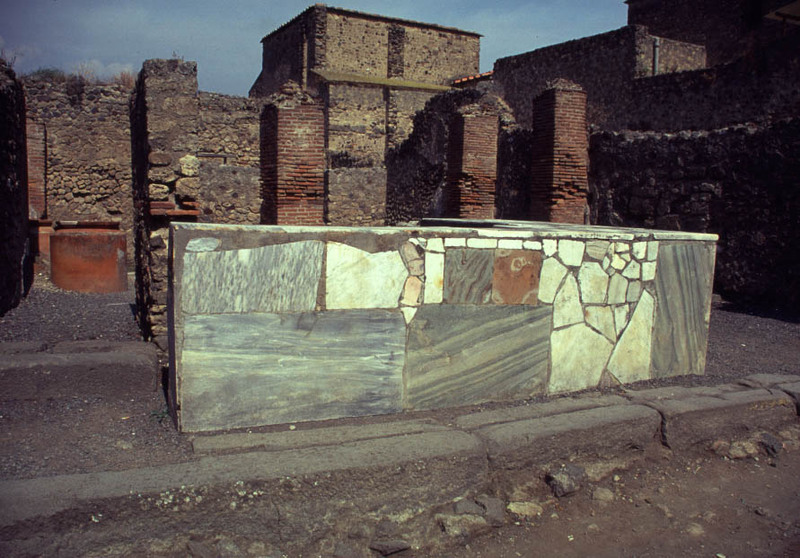 An excursion we went on was to Pompei and Vesuvius, the latter thankfully a bit sleepy. 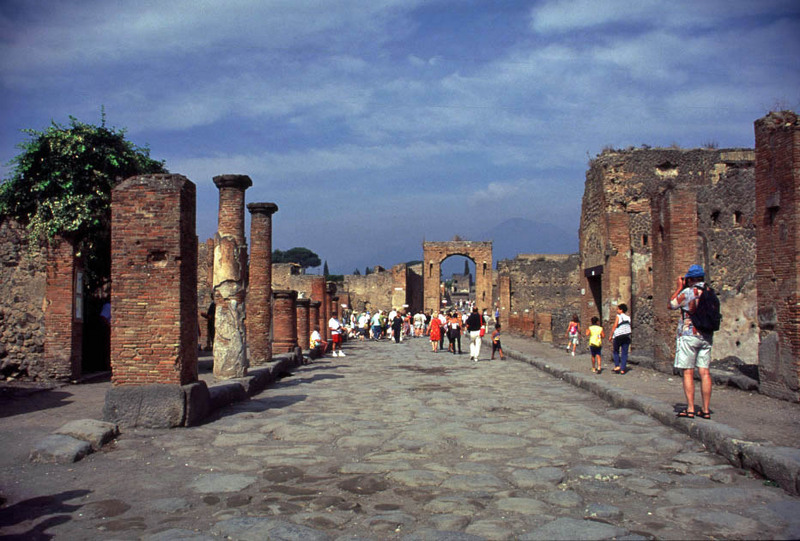 Pompei is very interesting, and one certainly cannot help but feel a certain frisson about the place. In many ways it is a somewhat sad place and sits there as a reminder of what Vesuvius can and will very likely do again, perhaps sooner rather than later. If it were to happen then the whole of Naples would be wiped out, with an incalculable loss of life. The archaeological work to uncover so much of that ancient town is incredible, with whole streets uncovered. All in all, a really memorable holiday that remains our favourite despite the other interesting places we have been to in Italy.